Mother’s parents emigrated from Sweden in the early part of the 20th century. These are the Swedish/Canadian Christmas customs passed on to their family . . .
My mom and Dad with her parents and three of her brothers. Christmas on our farm was a very special occasion, and was celebrated according to Swedish traditions. 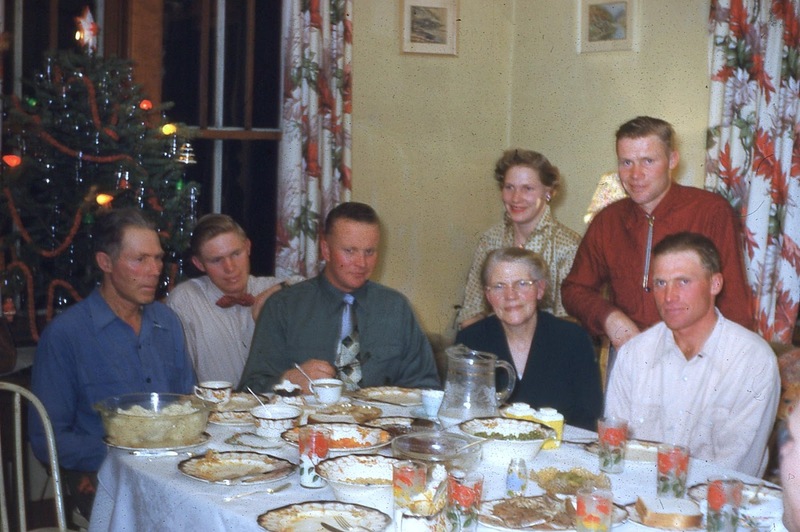 The preparations were a lot of work for Mother, but she often said that Christmas was the happiest time of the year. She was always pleased to have all the family home for Christmas. Mother would bring out the fine china and silverware for the festive season from Christmas eve through New Year’s Day. Great care was taken as she carefully transferred these exquisite dishes from the glass china cabinet to the dining room table. Only during these special occasions were meals served in the dining room. The round dining room table was expanded with extra leaves, then covered with a special white linen tablecloth which her mother had woven back in Sweden. Two white candles complemented the tablecloth. 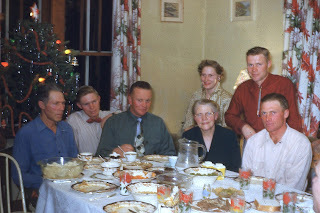 Traditionally, the Christmas Eve meal was to be all white (Lutefisk, mashed potatoes, canned peas in white sauce, turnip or boiled carrots, white bread, milk and rice pudding), but Mother included some colorful home grown vegetables. The main dish, of course, was the scrumptious lutefisk (Pickled cod fish) served with melted butter and seasoned liberally with salt and pepper. I’m not sure how the lutefisk was prepared other than being wrapped in a dish towel and steamed to the right ‘texture’. If it turned jellylike, it was not right! Would you believe there are actually some family members who do not appreciate the delicacy of lutefisk? The meal was not complete without dessert, a large bowl of rice pudding covered with fresh, thick cream. An almond nut was always mixed into the pudding. By tradition, the person who ate the almond would be the next to marry. Fortunately, one was not compelled to marry, otherwise I would have been married several times before I was sixteen years old! Another custom we followed was to be formally dressed for meals served in the dining room, with shirts and ties for Dad and the boys and best dresses for Mother and Enes. After supper, everyone pitched in with washing the dishes, putting the leftover food away, and getting prepared for the arrival of Santa Claus. The youngest members of the family checked periodically to see if Santa had dropped off the gifts in the sleigh near the front steps. Finally, presents arrived and were passed out and enjoyed late into the evening. Of all the many joys experienced in childhood, none can compare to the joy of receiving Christmas presents from Santa! And I need your help . . . 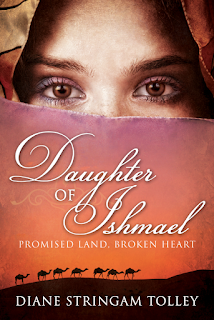 Daughter of Ishmael is up for the big award: Book of the year! It's simple and REALLY effective. Labels: From Uncle Leif's journals! I love family traditions, especially at holiday time, although I must admit I could do without the dressing up part. For me, part of the fun is being comfortable. Traditions always seem to mean "a lot of work" for the grownups, especially the women, but it's the only way to distinguish the day from all the rest. There is a balance I am always searching for! This is a lovely look into your mother's family Christmas time. Fascinating. What was the reason for the 'white meal'? Do you know? And yes, traditions too often do mean a heap of work for women. And Christmas is one of the worst. What lovely customs you had. I thought it was interesting that the meal was supposed to be all white. Glad your mother added a few vegetables. Sounds like a lovely way to spend Christmas Eve.